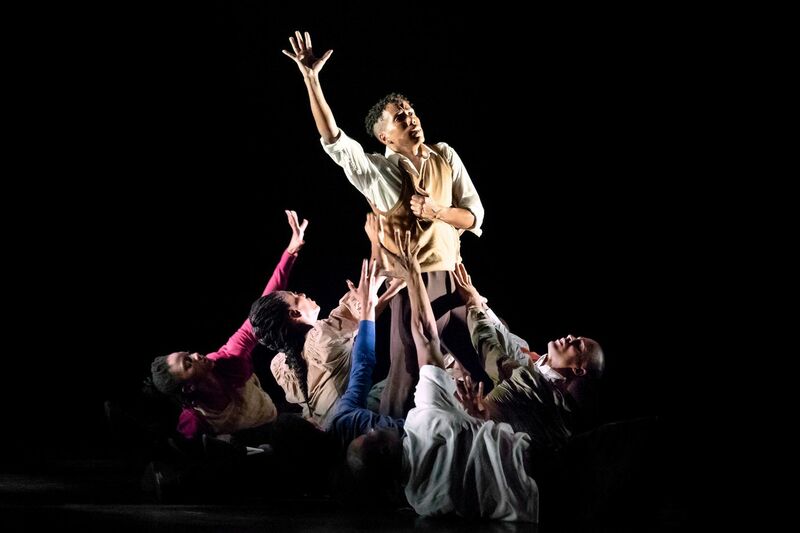 Alvin Ailey American Dance Theater in Rennie Harris' "Lazarus." Black History Month is wrapping up on Thursday, and on Friday two of the most important black dance companies in the world will be performing in Philadelphia. Indeed, Alvin Ailey American Dance Theater and Dance Theatre of Harlem are not just here the same weekend, but they are also opening the same night. It’s Ailey’s 60th anniversary season and DTH’s 50th. Plus, they’re both bringing new work by Philadelphia choreographers. So what’s a dance fan to do? “I’m going on Friday to Ailey and Saturday to Dance Theatre of Harlem,” said Brenda Dixon Gottschild, author of Joan Myers Brown & the Audacious Hope of the Black Ballerina, and numerous other dance books. Dixon Gottschild didn’t have to worry about which to see first, as she’s going with a dance journalist friend who has specific assignments. Ailey will be bringing the Philadelphia premiere of Lazarus to the Academy of Music. Created by Philadelphia hip-hop choreographer Rennie Harris (who is also artist in residence at Ailey), it is one of the most important works on Philadelphia’s spring arts calendar. Lazarus is about company founder Alvin Ailey, what it was like to be a black man 60 years ago when his company was young, and how the company survived the last 30 years without him. Philadelphia audiences may recognize a number of the dancers, as the city’s black dance company, Philadanco, has become something of a feeder system for the larger troupe. "At least four or five of my dancers go to Ailey or Broadway” each year, Philadanco artistic director Joan Myers Brown told the Inquirer last month. Meanwhile, at the Annenberg Center for the Performing Arts, Dance Theatre of Harlem’s new work Nyman String Quartet #2 will have its world premiere this week in the hometown of its choreographer, Robert Garland, who is also DTH’s resident choreographer. Dance Theatre of Harlem dances a studio preview of Robert Garland's "Nyman String Quartet #2." It will have its world premiere March 1 at the Annenberg Center for the Performing Arts. The run of black-dance luminaries continues beyond this weekend. BalletX will be opening its spring season at the Wilma Theater next Wednesday, and the diverse modern ballet company will feature the East Coast premiere of Lil Buck’s Express. Lil Buck is a choreographer and dancer who specializes in the Memphis jookin style of street dance and has danced in an Apple commercial. Following that, Rennie Harris fans will have two additional chances to see the choreographer’s work this spring. He will be creating a new work for Philadanco to premiere April 12 at the Kimmel Center’s Perelman Theater. And his own company, Puremovement, will dance Funkedified in June at the Merriam Theater. That show, an autobiographic work featuring 1970s funk, premiered off-Broadway last year. Years can go by without a chance to see Harris’ work in his hometown, so this spring’s profusion of opportunities is something special. These companies and dances are important beyond the African American community, Dixon Gottschild said. “When you come right down to it, none of the contemporary companies that we know about [would exist] without having some deeply rooted blackness, if you will, in how they think about aesthetics, how they choreograph.